Life isn't always cheap south of the border—some lives are worth a million dollars. That’s what the Mexican kidnapping cartel was demanding for Carl Ledbetter’s wife. So Carl reached out to the one person he knew with a chance in hell of saving her, a deadly man whose own life he’d saved in the sands of Iraq. It was time to call in some favors. Because some situations call for negotiation, but some...call for gun work. 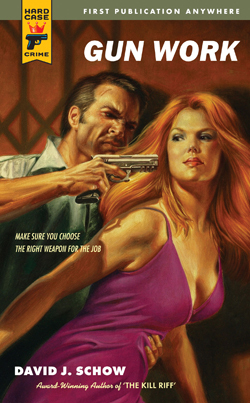 Publishers Weekly on GUN WORK: "Schow...lets out all the stops in this high-caliber action story...This is a gory, fast-paced pulp tour de force in the classic style." "One dark speeding bullet of a novel...It’s a book I couldn’t put down." "All of Schow’s glittering weapons are sharper than ever before." "If the pulps were still around, Schow would be their king."